“Now we have the right people, in the right place, with the right technology!” exclaims EMBL group leader Thomas Schneider, who coordinates activities at the EMBL crystallography beamlines on DESY’s light source PETRA III in Hamburg. 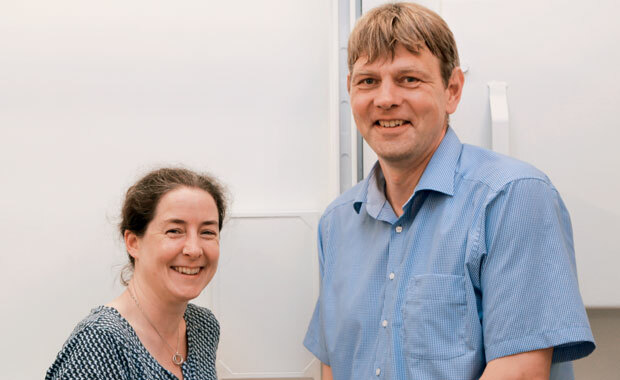 Together with Arwen Pearson, Professor at the Centre for Ultrafast Imaging (CUI), Universität Hamburg, he and his team have been laying the groundwork to take crystallography – his structural biology method of choice – into a new time dimension. Crystallography uses powerful X-ray beams to probe the 3D atomic structure of biological molecules such as proteins. As the X-rays bounce off the atoms in the protein, a distinctive pattern is produced that reveals information about its structure. This information can help scientists understand not only what a protein looks like, but also how it works and interacts with other molecules. 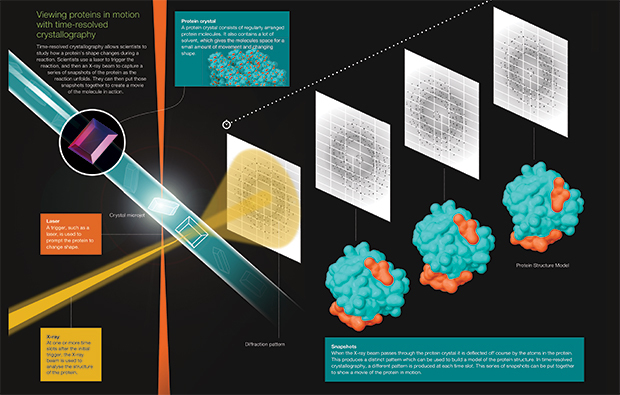 “Crystallography gives us a single snapshot of a molecule in a single state,” explains Pearson. “If you’re lucky, your data will also allow you to see how it is bound to another molecule and you can begin to extrapolate how that molecule works.” But sometimes one structure alone is not enough. The whole of the protein can be involved in a binding event and any subsequent chemical reaction, and it changes shape as the molecules lock into place. “But just how the entire structure moves and changes shape is not really understood,” says Pearson. 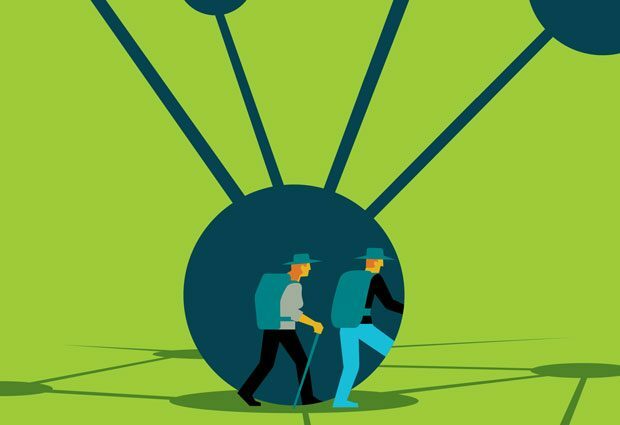 “What we really want to do is to watch this process in motion.” Instead of just one snapshot, time-resolved crystallography involves taking many snapshots in quick succession to create a film of the molecule in motion, similar to running many photos together to make a movie. Time-resolved crystallography is still very much a niche method, with complex requirements for both sample preparation and experimental set-up. Even defining when everything starts – Time Zero – is tricky. The reaction has to be triggered by a “pump” – a light pulse or a temperature jump for instance. “Just imagine me giving you a push,” says Pearson. “The push, or pump, triggers you to start falling over, and we can watch what happens when you do. That push defines Time Zero.” As the protein starts to move, the X-ray beam is used to probe the 3D structure of the protein at regular intervals thereafter, capturing information about the structure at different stages of the process. This “pump-probe” concept won Ronald George Wreyford Norrish, George Porter and Manfred Eigen a Nobel Prize in Chemistry in 1967 and is widely used in time-resolved experiments. Some naturally light-sensitive proteins, like those involved in vision, can be easily triggered using bright laser pulses. Otherwise, a ‘reaction initiation strategy’ must be painstakingly worked out for each new protein. Once this has been established, the crystallographic experiment itself requires a very bright X-ray source and clever strategies to ensure data of sufficient quality are obtained. These issues are the current focus of Pearson’s research at the CUI and will be central themes for the new Hamburg Advanced Research Centre for Bioorganic Chemistry (HARBOR), which is being coordinated by Pearson and is soon to be established at the Universität Hamburg. To catch a process in action, you also need to be able to work on the same timescale at which the reaction occurs. “With the new European X-ray Free Electron Laser being built here in Hamburg, we will be able to observe extremely fast chemical reactions,” explains Pearson. “But we are also interested in watching mechanistic structural changes – these occur on timescales that are already accessible to us at the beamlines. Currently, we can see reactions that occur in the millisecond range, but plans are afoot to further optimise the beamline so we can start to look at fascinating events happening on nano- and microsecond timescales.” With grant funding from the German Federal Ministry for Education and Research, the groups will be able to extend the EMBL beamline P14 to establish an additional endstation dedicated to time-resolved crystallography. It was a talk by Pearson at the European Crystallography Meeting held in Warwick, UK in 2013 that got Schneider thinking and made him realise that time-resolved experiments might actually be possible on the EMBL crystallography beamlines at PETRA III. Discussions then really kicked off a year later when Pearson took up her post as Professor at the CUI, just across the road from the EMBL beamlines on the DESY campus. “The facilities at PETRA III were the reason I came to Hamburg!” says Pearson with a smile. “Hamburg is currently the epicentre of time-resolved science, and is the place to do these types of experiments,” she adds excitedly. We are the gadget guys! But the ongoing development and establishment of the technique in Hamburg wouldn’t be possible without the dedication of many people behind the scenes, say Schneider and Pearson – from the EMBL beamline Project Evaluation Committee who recognised the unique opportunity, to the instrumentation teams based in both Hamburg and Grenoble who provide dedicated support to the project. “Time-resolved crystallography is by no means standard, and it is crucial to have the support and expertise of people like Gleb Bourenkov, a principle beamline scientist at P14 who has tested different set-ups on the beamline,” says Pearson. This article was published in the Summer 2016 edition of the EMBLetc magazine.